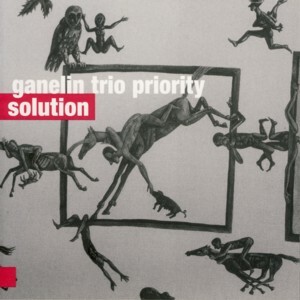 This is a live recording by the Ganelin Trio PriorityFind albums by this artist, led by Israeli (of Lithuanian roots) pianist / composer Vyacheslav GanelinFind albums by this artist with Lithuanian saxophonist Petras VysniauskasFind albums by this artist and German drummer Klaus KugelFind albums by this artist. It presents an Improvised Music piece, divided into eight sections, all co-composed by the trio members. The recording, which was done a few years before it was released, is available here for the first time. Ganelin´s legendary status as one of the world´s leading Free Jazz / Improvised Music pioneers was established already in the 1970s, while he was still residing in Lithuania, which at the time was a part of the USSR. His stunningly original and prophetic music, which under bizarre circumstances was released by the solitary Soviet State owned record label MelodiaFind albums on this label, struck the listeners (albeit only a few at the time) as completely innovative and original, way ahead of most that was happening in that area anywhere else in the world. Ganelin continues to create wonderfully innovative music since and his recorded legacy is a symbol of excellence and ingenuity. He founded the Ganelin Trio Priority as a working and touring ensemble, which plays concerts and festivals around the world. He also composes music for theatre and cinema and teaches composition as the Jerusalem Academy of Music. This wonderful album is an exquisite example of the trio at work, performing Improvised Music which sonically sounds like a Symphony Orchestra and musically keeps the listener on his toes at all times. Ganelin uses piano and synthesizers to create the sound layers while Vysniauskas improvises melodically on top and Kugel charges the music with incredible rhythmic tension. Together they sound like a three-headed Apollo uttering Godly sounds to charm the humans. It is almost impossible to think of this music as a collective improvisation, as it sounds more "composed" than most composed contemporary Classical music, thanks to Ganelin´s extraordinary intrinsic sense of melody and the great talent of Vysniauskas to weave the musical threads into a spectacular colorful canvas. Kugel complements the trio perfectly with his respectful and highly attentive attitude, filling the missing pieces which require rhythmic elements of simply adding supplementary ornamentation. Overall this is a brilliant album from start to finish, almost a "book" example of Improvised Music and its true vocation, and should serve as an example and a beacon to all other Improvising Musicians. Of the numerous Free Jazz and Improvised Music albums released on the For TuneFind albums on this label label, this is definitely one of the absolute best ones so far. An essential listening experience!